On the Com4® yarn booth at the ITMA in Milan, the fabric samples of the Com4® licensees are in demand with yarn dealers and downstream processors. Currently the largest exhibition for textile and apparel machinery worldwide is being held in Milan, Italy. In the section „Fibres and Yarn“ Rieter Machine Works Ltd. is present with the Com4® yarn booth. On show are also interesting fabric samples produced from the high-quality Com4® yarns of licensees. Yarn dealers and downstream processors, who are specifically looking for suitable yarns for their end product, showed great interest. By means of the given contact data, they can instantly get in touch with the licensees and therefore quickly obtain their desired yarn. Com4® is a globally registered trademark of Rieter. Belonging to the family of the Com4® yarns are Com4®ring, Com4®compact, Com4®rotor and Com4®jet - high-quality yarns, spun on the 4 Rieter end spinning systems. Rieter customers who produce with these end spinning machines can apply for a Com4® licence. Licensees profit from the broad support given by Rieter. 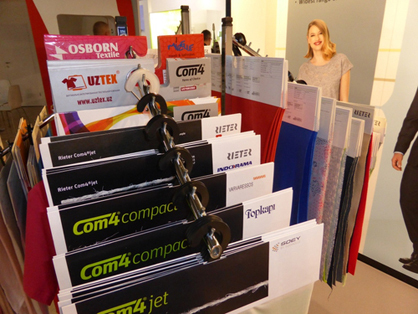 Pic: Yarn dealers and downstream processors showed great interest in the fabric samples of the Com4® licensees.